All Our Eggs in One Basket for sale. Buy online at Zingerman's Mail Order. Gourmet Gifts. Food Gifts. I won't walk on eggshells here when I tell you that we've gone and flaunted that age old advice. They say, "Don't put all your eggs in one basket." We say, "Don't tell us what to do!" They should be grateful that at least we didn't kill the golden goose to make it happen. 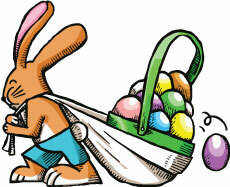 Just for Easter, we've put all our various Easter eggs together in one big basket. (OK, technically, it's a wooden crate with "Zingerman's" emblazoned across the lid, but that's not part of a catchy idiom.) The collection includes huge chocolate stuffed eggs from Chocolat Moderne, bean-to-bar crafted chocolate eggs from Fruition Chocolate, chocolate and hazelnut eggs inside real eggshells, and one Golden Egg from Veruca Chocolates. In all, there are a dozen eggs. And just for good measure, we tossed in a couple of bags of handmade raspberry and coconut marshmallow "Bunny Tails" from Zingerman's Candy Manufactory. Sure to be the fullest flavored—and the most fate tempting—Easter basket on the block.